Shoka slipped the ticket into her coat pocket and left the cinema. She still had a good half hour before the film began, leaving her plenty of time to roam around the neighborhood. When at first she stepped into the store the harsh light of the chandelier threw her off. She shut her eyes, opened them, and almost immediately had a sense of déjà vu—she’d dreamt of a place exactly like this just the other night. Well, perhaps not exactly like this. The mannequins in her dream had not been so slender and refined, after all. Nor had they been wearing the white sequined dresses with all that extra lace and gauze. In the dream, as now, she’d been in a bridal shop. But those dream mannequins—they’d been truly enormous. She recalled panicking, trying her best to get away from them, watching her dream self walking backward toward the entrance door. But no matter how hard she tried she still couldn’t get out of there. Something was holding her back in that bridal shop dream. Finally she’d looked behind her to see a gaunt, scrawny hand clutching at her skirt, pulling at her with strength you wouldn’t imagine it possessed. Seeing the place she’d stumbled into, Shoka wondered if she shouldn’t have done something altogether different tonight. Maybe a long walk would have been better. But the evening was cold. A sharp chill had replaced the heavy snow now. She had to pause and catch her breath. Dream and reality had intersected too soon for her. Too soon, not soon enough perhaps. She had to backtrack ten years for another bridal shop scene like this. Ten years earlier, when she’d come to pick out a wedding dress for a 19-year-old Shoka. But she hadn’t come alone that time. Her mother had been with her. Shoka of course hadn’t liked any of the dresses. It was a good enough excuse to call off the marriage. And she’d been sure to make her mother quite miserable about the whole affair. Shoka, why do you have to be so damn stubborn? She was still lingering by the door, her eyes on that chandelier. The thing looked like an obscene wedding cake with stacks of crystal dangling from it. It took a while before she realized there was a young woman standing in front of her. The woman held onto a large white box, waiting for Shoka to acknowledge her frown and move out of the way. Shoka smiled weakly. “Pardon me.” The woman brushed past her without saying a word. Shoka hesitated next to one of the mannequins for another minute before finally deciding she’d just hang around the store until the movie began. Better than having to freeze outside. It was almost closing time, but the store was still packed with customers. She watched the tired-looking salesgirls in their chocolate-colored knee-length coats and white headdresses going back and forth, back and forth between customers. Shoka’s film ticket, meanwhile, was by now rolled into a neat little ball in her pocket and she still couldn’t leave the thing alone. She glanced at the young women in the shop. Most of them couldn’t have been more than 19 or 20. They all wore high heels and had on nail polish. They’d take cautious steps toward whatever dress had grabbed their attention, then they’d step back again to get a full view of the mannequin from every possible angle. How happy these brides-to-be looked! Already they saw themselves in those elaborate costumes. And elaborate the costumes were. It seemed to Shoka that wedding gowns had been a lot simpler and less affected ten years earlier. A diminutive salesgirl was approaching her now. Shoka would have liked nothing better than to disappear among the mannequins and be left to herself. But the girl was already speaking to her. She had to pass through huddles of busy customers and their lingering perfumes. The other end of the store was quieter. You could smell the scent of recently ironed fabric. She’d always liked that scent. It made her think everything around her was clean and orderly. There were a couple of mannequins next to the couch too. One had a very tight dress clinging to it, while the other wore a wide round skirt held up with curious springs from underneath. The couches were fake leather, cream colored—the kind you saw in any old office or doctor’s waiting room. She took off her coat and sat down. To her left she caught sight of a hefty woman sitting behind a white desk. The woman had a fleshy hand dotted with too many rings stuck under her chin, and was yawning hard. Probably the store owner, Shoka thought. Across from the owner sat another woman. She had her back to Shoka. This one had a small body but substantial haunches that seemed to spill out of the chair. The two of them were talking. Next to them was a back door that was ajar, and beyond it Shoka could see the workshop and its rows of sewing machines. Women in identical blue headdresses were still busy at the work stations. That was where the smell of hot ironed fabric had to be coming from. She took her shawl off too and laid it next to the coat. An old woman was sitting across from her on another couch. A little farther from the old woman a girl and a salesclerk sat talking. You could see the front of the girl’s carefully parted red hair left out of the veil on purpose. She thumbed enthusiastically through the bridal magazine, looking up now and then to gauge the worn-out salesclerk’s reaction. The other woman’s opinion, it seemed, meant a lot. The magazine Shoka had picked out was so thick she thought it would take her all night to leaf through it. She looked for the date. She’d guessed it to be an old volume and it was, going back to around the same time when she herself had been looking for a wedding dress. In fact, the store didn’t seem to have any new magazines at all. Though that wasn’t really the odd part. The odd part was that if the magazines were still the same magazines, why had people’s tastes changed so much? Why did the dresses in the store seem either garish or provincial? The red-haired girl was laughing out loud all of a sudden. Shoka looked up to see what she was going on about. The girl seemed to be excited about one of the dresses in the magazine she was holding. She kept pointing it out to the salesclerk and repeating herself. Shoka had to turn away. Vulgar girl! What if the old woman sitting near them was sleeping? Why did she have to shout everything? But the old woman wasn’t asleep anymore. She’d paired her crooked feet as best she could and kept clicking her black shoes together, as if keeping time. Shoka held a steady eye on her. The old lady looked very frail in her blue overcoat and headdress. She too had one of those same white boxes the other customers carried out with them. She kept the box on her knees, and her eyes on the store owner. What pale skin, Shoka thought. Everything about the old woman seemed to disappear—thin lips, slight bony nose. Shoka caught a glimpse of the store owner watching the old woman for a second and then turning her attention back to the woman with the wide haunches. Shoka stayed put, the magazine in her lap. The first page had a picture of a model with a garland of tiny white and purplish flowers in her hair. The dress she wore was pale blue. None of the mannequins in this place had on blue dresses. Mostly they wore white or pink satin, with pearls and sequins sewn on. Shoka couldn’t picture the red-haired girl wearing a blue dress. Maybe dark green, even brown. She had to smile. Poor girl hadn’t come here to pick out a dress for a funeral, had she? Nonetheless, Shoka was certain that only dark colors would complement that pallid skin of hers. Shoka leaned back and let her gaze return to the old woman with the white box. She was still clicking the heels of her shoes together. The shoes were shiny yet cracked with age, the heels square-shaped and low. Serviceable shoes, still. They might have even been pretty at one time, Shoka reflected. She got lost in her own thoughts for a while, then the next time she looked up she saw that the old woman’s eyes were on her. She smiled back, but the old woman’s attention wasn’t really with her. Instead, she seemed to be focusing on the store owner, who now had both hands under her chin and was very noticeably trying to avoid the old woman’s stare. Bride of Angels. That was the store’s name and it was stamped over the white box the old woman had on her knees. Shoka could even see the little wedding song written on the box beneath the store name. Bride of Angels. What a peculiar name for a bridal shop! Made you think more of the inevitable journey to the next world instead of a nuptial ceremony in this one. Didn’t people catch these kinds of subtleties anymore? Obviously not. Obviously! In any case, she mused, in that white box there was bound to be another carefully wrapped wedding dress ready to go, ready for someone’s so-called moment of fortune. The red-haired girl had stood up, still laughing. When she laughed you could really see her buckteeth talking back at you. It took Shoka a second to realize the girl was addressing her. About time you did, she wanted to say. But the girl was standing there holding the magazine up for Shoka so she could get a good look at the dress. Shoka leaned forward, fixed her eyes on the magazine page and smiled for the girl’s sake. The one thing this bridal shop wasn’t short on were dresses like the one the girl had picked out. Why did she have to spend so much time searching through catalogs for dresses that were all around her? She stole a glance at the girl, whose mood had visibly changed all of a sudden. Maybe she had caught on to what was going through Shoka’s head, because now she grimaced at the other woman’s silence, gripped the magazine close to her chest and stomped past the couches. As she did, she almost knocked over the white box on the old woman’s knees. Shoka watched the teetering box. The old woman’s eyes had been shut again and she hadn’t really noticed, or at least gave it no mind. But there was an “Ouch!” from the girl, and then she marched up to the store owner’s desk. The store owner, too, offered the girl a smile. Her entire chin had gone red from pressing so hard on it with both hands. She gave a cursory glance at the page the red-haired girl laid out in front of her. A nod and a wink, as in “I like your style.” Then as soon as the girl turned triumphantly away, the fat lady resumed her yawning. Her bored, uninterested eyes spanned the room, resting on Shoka and the old woman for a second, before turning wearily back to the woman sitting in front of her. Shoka turned to see that same salesgirl who had pointed her this way addressing her again. Beautiful outfit? She wanted to tell the girl she was only on page one. Which beautiful outfit? It didn’t matter. She smiled and let the girl go on. “First page it is then. Let me get my pencil and mark it for you.” The girl sat next to her and in a quick fluid motion snatched the magazine off Shoka’s legs and marked it. Now she was telling Shoka it would be better if she returned tomorrow for measurements. It was too late for that tonight. Shoka sighed with relief, almost giddy with the thought that she didn’t have to stay here anymore. She was worried about the movie. It would start soon. She’d spent enough time, she thought, playing mannequin in this place—a sitting mannequin with page one on her lap. Instinctively Shoka and the salesgirl leaned back in the couch. Shoka watched the old woman, who hadn’t been clacking her heels for some time. Shoka waited for her to go on, not laughing. The girl shrugged. “Your guess is as good as mine. She won’t talk. She’s sat in the same place all day saying nothing. All I can tell you is that dress hasn’t been worn once. Look! the box is still sealed. It hasn’t been touched. We tried taking it from her but she wouldn’t let go. Stubborn old lady,” the girl added with frustration in her voice. They both contemplated the old woman for a while. She was snoring now, but her skeletal hands still kept a tight grip on the box. Besides a few other salesgirls, herself, and the old woman there was hardly anyone else left in the place. The store owner was half asleep leaning over her white desk; there was no sign of the woman she’d been talking to. Shoka too stood up. It looked like seeing a movie was out for the night. The mere thought of the chill outside made her bones feel cold. She buttoned up her coat, glancing one more time at the old woman and at the salesgirl she’d been talking to. She would have said good-bye to her, but the girl was busy chatting with her coworkers now. At the exit Shoka stopped and turned around one more time. The bridal shop seemed to have grown; it seemed vastly larger than before. —Maryam Mortaz was born and raised in Iran, daughter of an Iranian mother and a Russian/Georgian father. She immigrated to the United States in 2000. Her first book of short stories, Pushkin and Other Stories, was published in Iran in Persian in 2001. “Bride of Angels”is a short story from that selection translated by Salak Abdoh. This First Proof contains the story “Theta” by Carolina Lozada, translated by Katherine Silver. Fabulism and absurdity from an under-appreciated Italian master. 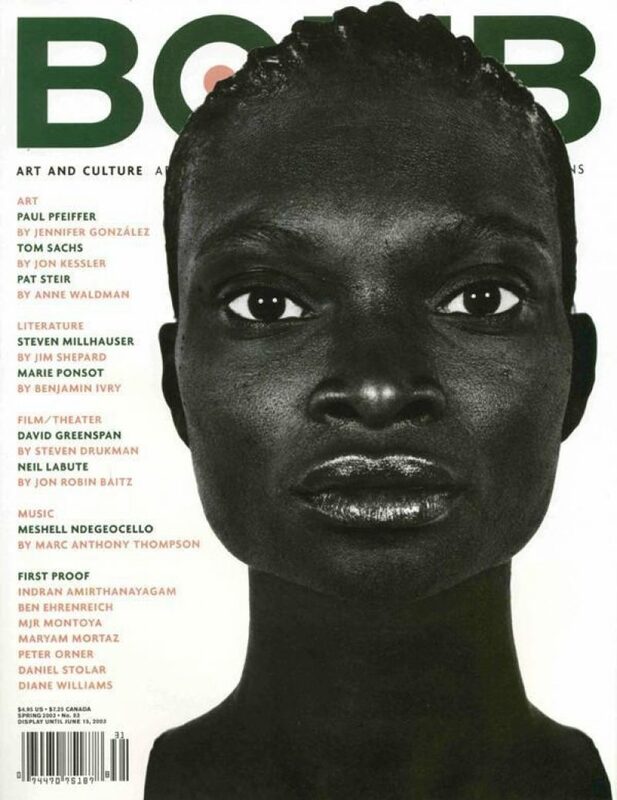 Featuring interviews with Paul Pfeiffer, Pat Steir, Tom Sachs, Marie Ponsot, Steven Millhauser, Meshell Ndegeocelo, David Greenspan, and Neil Labute.